Hiya, anime fans! We here on the VIZ Media Animation team are looking for even more ways to bring you anime the way you want it! We’re hoping you’ll take a couple minutes and help us by honestly answering this short survey and tell us a bit more about your anime origin story! There are no wrong answers and every reply will be read and considered carefully by our staff. We appreciate it from the bottom of our hearts! This should take about 5 minutes. Are you ready? Let's go! How long have you been watching anime? *This question is required. 1. When did you start watching anime? *This question is required. 2. How did you FIRST start watching anime? Please select what most applies to you. *This question is required. 3. What was the FIRST anime you watched? 4. What were your first fandoms for anime? Please list the first 1-3 anime titles you got REALLY into! 1. Please enter an 'other' value for this selection. 2. Please enter an 'other' value for this selection. 3. Please enter an 'other' value for this selection. 5. How do you currently watch brand new (or new to you) anime series? Please select all that apply. *This question is required. 6. What is your FAVORITE way watch brand new (or new to you) anime series? Please select the one item where you are most likely to get exposed to new anime. *This question is required. 7. Do you pay for a cable TV package? *This question is required. 8. Do you subscribe to any of these streaming services? Please select all that apply. *This question is required. 9. Do you own any of these devices? Please select all that apply. 10. Where do you live? *This question is required. 11. What is your age? *This question is required. 12. What is your gender? *This question is required. 13. 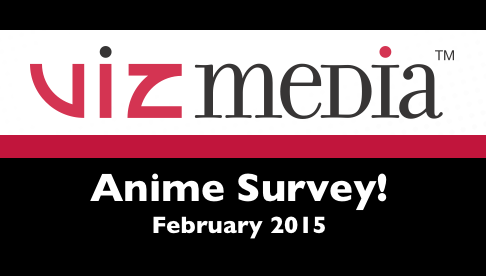 Would you like to subscribe to the VIZ Media anime mailing list? We promise to only send you awesome anime related stuff and never ever spam you. *This question is required. Yes, that sounds fabulous! Here’s my email: Please enter an 'other' value for this selection. 14. Would you like to subscribe to the VIZ Media SAILOR MOON mailing list that we will be starting soon? This list will be dedicated to all things SAILOR MOON, both the Classic series and SAILOR MOON CRYSTAL. Just like with the VIZ Animation list, we will never share or sell your email and never spam you. *This question is required. Yes, I would LOVE to get the latest info on Sailor Moon! Here’s my email: Please enter an 'other' value for this selection. 15. Anything else you would like to share with the VIZ Media Animation team?